GB_2 accepted D20827: Reword some text, a couple clean ups, add a separator. GB_2 added a project to D20827: Reword some text, a couple clean ups, add a separator: VDG. GB_2 added a comment to D17936: Rewrite the front-end of docs.kde.org. And also make it blue like the other search button. GB_2 accepted D20796: [Pager] Port settings window to QQC2+Kirigami FormLayout and improve UI. GB_2 added a comment to D19812: Add a web page to view and compare icons of different sizes. I personally think this could be quite useful. Just one tip, I'd replace the "Search" button with a search icon, since it looks better and the search placeholder already says "Search...". GB_2 added a comment to D19829: kicker: add option to make root level icons visible. GB_2 added a dependent revision for D20818: Add the Show Desktop applet (moved from kdeplasma-addons): D20820: Add Show Desktop applet to default panel. GB_2 added a dependency for D20820: Add Show Desktop applet to default panel: D20818: Add the Show Desktop applet (moved from kdeplasma-addons). GB_2 removed a dependency for D20818: Add the Show Desktop applet (moved from kdeplasma-addons): D20820: Add Show Desktop applet to default panel. GB_2 removed a dependent revision for D20820: Add Show Desktop applet to default panel: D20818: Add the Show Desktop applet (moved from kdeplasma-addons). GB_2 added a dependency for D20818: Add the Show Desktop applet (moved from kdeplasma-addons): D20820: Add Show Desktop applet to default panel. GB_2 added a dependent revision for D20820: Add Show Desktop applet to default panel: D20818: Add the Show Desktop applet (moved from kdeplasma-addons). GB_2 requested review of D20820: Add Show Desktop applet to default panel. GB_2 added a dependency for D20817: Remove the Show Desktop applet (it's in plasma-desktop now): D20818: Add the Show Desktop applet (moved from kdeplasma-addons). GB_2 added a dependent revision for D20818: Add the Show Desktop applet (moved from kdeplasma-addons): D20817: Remove the Show Desktop applet (it's in plasma-desktop now). GB_2 requested review of D20818: Add the Show Desktop applet (moved from kdeplasma-addons). GB_2 requested review of D20817: Remove the Show Desktop applet (it's in plasma-desktop now). GB_2 updated the task description for T10827: Website redesign. GB_2 closed D20791: Rename "edit-remove" icon to "edit-delete-remove" to support Oxygen and other icon themes. GB_2 committed R266:2cbbfe2351a6: Rename "edit-remove" icon to "edit-delete-remove" to support Oxygen and other… (authored by GB_2). 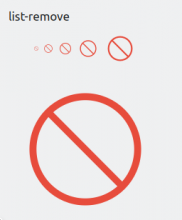 GB_2 requested review of D20791: Rename "edit-remove" icon to "edit-delete-remove" to support Oxygen and other icon themes. GB_2 renamed T10384: Unify styles for lists and their buttons from Unify styles for Add & Remove buttons on lists to Unify styles for lists and their buttons. GB_2 added inline comments to D20747: [FifteenPuzzle] Port configuration window to QQC2 and Kirigami.FormLayout and improve UI. GB_2 added a comment to D20576: Add new notifications KCM. You can now use edit-remove, which got added in D20700. GB_2 closed D20700: Add "edit-remove" icon symlink and add 22px version of "paint-none" and "edit-none". GB_2 committed R266:7c6559bdb86f: Add "edit-remove" icon symlink and add 22px version of "paint-none" and "edit… (authored by GB_2). GB_2 updated the diff for D20700: Add "edit-remove" icon symlink and add 22px version of "paint-none" and "edit-none". GB_2 retitled D20700: Add "edit-remove" icon symlink and add 22px version of "paint-none" and "edit-none" from Add "edit-remove" icon symlink and add 22px version of "paint-none" to Add "edit-remove" icon symlink and add 22px version of "paint-none" and "edit-none". GB_2 accepted D20743: [Kicker] Modernize settings window. GB_2 updated the summary of D20730: Change default window actions modifier key to Meta. GB_2 abandoned D20730: Change default window actions modifier key to Meta. GB_2 added a comment to D20730: Change default window actions modifier key to Meta. GB_2 requested review of D20730: Change default window actions modifier key to Meta. GB_2 retitled D20700: Add "edit-remove" icon symlink and add 22px version of "paint-none" and "edit-none" from Add "edit-remove" icon symlink to Add "edit-remove" icon symlink and add 22px version of "paint-none". GB_2 committed R266:1c6e30d312c7: Use consistent default Kickoff user icon (authored by GB_2). GB_2 closed D20564: Rename colorful user gallery avatar. GB_2 committed R128:774c4c628d72: Rename colorful user gallery avatar (authored by GB_2). GB_2 added a comment to D20700: Add "edit-remove" icon symlink and add 22px version of "paint-none" and "edit-none". GB_2 abandoned D20709: [kcmkwin/kwindecoration] Use correct defaults and reset button icons in window decorations configuration window. GB_2 updated the task description for T10047: Guerilla UX testing: a GNOME switcher. GB_2 requested review of D20709: [kcmkwin/kwindecoration] Use correct defaults and reset button icons in window decorations configuration window. GB_2 added a comment to D20564: Rename colorful user gallery avatar. The part I don't understand, how does renaming this file change anything? GB_2 retitled D20564: Rename colorful user gallery avatar from Rename default user gallery avatar to Rename colorful user gallery avatar. GB_2 updated the summary of D20564: Rename colorful user gallery avatar. GB_2 updated the summary of D20700: Add "edit-remove" icon symlink and add 22px version of "paint-none" and "edit-none". GB_2 retitled D20700: Add "edit-remove" icon symlink and add 22px version of "paint-none" and "edit-none" from Add "edit-remove" icon to Add "edit-remove" icon symlink. GB_2 requested review of D20700: Add "edit-remove" icon symlink and add 22px version of "paint-none" and "edit-none". GB_2 committed R596:f9015ff1bad2: Don't set Breeze as icon theme (authored by GB_2). GB_2 closed D20650: Don't set Breeze as icon theme. GB_2 added a comment to D20650: Don't set Breeze as icon theme. GB_2 added reviewers for D20564: Rename colorful user gallery avatar: afiestas, broulik. GB_2 requested review of D20650: Don't set Breeze as icon theme. GB_2 added a comment to D20612: [Kickoff] Modernize settings window layout. GB_2 retitled D20638: [Widget Explorer] Continue using a trash can icon for deleting delegates from [WIdget Explorer] Continue using a trash can icon for deleting delegates to [Widget Explorer] Continue using a trash can icon for deleting delegates. GB_2 accepted D20638: [Widget Explorer] Continue using a trash can icon for deleting delegates. GB_2 added a comment to D20549: Improve the look of the Plymouth Boot Splash Screen KCM UI. @broulik Do you want to commandeer this revision and do the rest? GB_2 updated the diff for D20549: Improve the look of the Plymouth Boot Splash Screen KCM UI. GB_2 added inline comments to D20549: Improve the look of the Plymouth Boot Splash Screen KCM UI. GB_2 committed R119:c308122688ee: Add alternatives button to applet configuration in panel edit mode (authored by GB_2). GB_2 closed D17410: Add alternatives button to applet configuration in panel edit mode. GB_2 updated the diff for D17410: Add alternatives button to applet configuration in panel edit mode. I agree that they should match each other. I think @ndavis is working on that in D20623, as a matter of fact! GB_2 added a comment to T10384: Unify styles for lists and their buttons. GB_2 added a comment to D17410: Add alternatives button to applet configuration in panel edit mode. GB_2 added a member for Plasma: KCM Redesign: GB_2. GB_2 claimed T3040: update KCM usability. GB_2 added a comment to D20283: [RFC] [SimpleKCM] Fix height calculation. GB_2 accepted D19077: Redesign the theme preview window. GB_2 updated the diff for D19077: Redesign the theme preview window. GB_2 updated the summary of D20549: Improve the look of the Plymouth Boot Splash Screen KCM UI. GB_2 renamed T10799: Update outdated artwork, branding, logos, colors and screenshots from Update outdated artwork, branding, logos and screenshots to Update outdated artwork, branding, logos, colors and screenshots. GB_2 created T10799: Update outdated artwork, branding, logos, colors and screenshots. GB_2 added a comment to D15423: System settings: make date/time format preview consistent. GB_2 added a comment to D20140: [GridDelegate] Fix gaps in corners of thumbnailArea highlight. GB_2 added a comment to D19077: Redesign the theme preview window. then, anywhere under this item you access Kirigami.Theme.backgroundColor and will be the background color of the view, because you defined it to use the color set for views.